The world has been undergoing painful changes for a long time. But the uncertainty that is spreading now concerns not only the future, but also the effectiveness of the known methods of solving social and political problems. As August approaches, organized political life calms down. In what state does international politics go on nominal vacation until the autumn? The key events of the recent past were the Minsk process, the rise of the Islamic State, the worsening of Greek debt crisis and the successful conclusion of negotiations on the Iranian nuclear program. Each of these phenomena has its own background and logic, but altogether they make up quite a complete picture of global politics. Ukraine, Greece and Iran are the three faces of modern diplomacy. 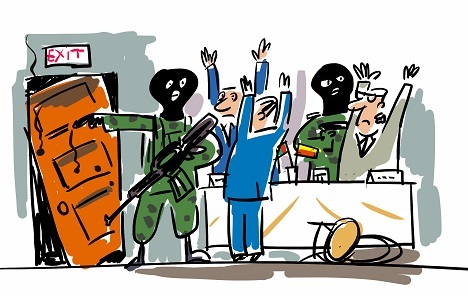 The Minsk process is an example of a desperate attempt to stop the massive bloodshed in a situation when neither the conflicting parties nor their ultimate goals are quite clear. The efforts of negotiators were aimed at developing minimally specific formulations, since no one wanted to assume clear and accurately stipulated obligations. The destiny of the agreements is quite characteristic. The disputes are not even about who fulfills the agreements, but about what fulfilling actually means. At the same time, everyone repeats, like a mantra, that there is no alternative to the Minsk agreements, and in fact it's true. Stopping the big war is an achievement and lasting peace, it seems, is simply impossible. It is clear that the situation is fragile and dangerous, but it illustrates one of the truths of the day- in a world that is in a state of transition to who knows where, there are certain problems that are insoluble. The most that can be done is to minimize them. In comparison to the situation in Ukraine, Iran's talks represent the opposite pole. They dragged on for so long because the main participants - Tehran and Washington - have sought to literally verify every step, in order to avoid any double interpretations. The reason is simple: complete distrust towards each other. There's no place for gentlemen's agreements, everything must be recorded, with control mechanisms being thought of in advance. Only this way there is a chance for execution, and the current deal provides hope. The Geneva-Vienna process (unlike the Minsk one) has shown that if the parties know exactly what they want and really want to find an agreement, a lot can be achieved. It is clear that the general situation added to the political will. The crumbling Middle East drives the parties to eliminate earlier restrictions and seek new forms of political survival. Greece represents another option. The achieved “compromise” has left everyone with a heavy aftertaste and a feeling that nothing has been solved. On the one hand, it has been clear for a long time that things need to be straightened out in the Eurozone, and since consensus can't be reached by itself, someone's leadership is required. This someone is obviously Germany, the most powerful country in the European Union. On the other hand, the manifestation of this leadership scared everyone, and most importantly, brought up a question: does the leader know what to do? Nevertheless, the Eurozone crisis has demonstrated the third type of negotiation approach: the dictate of the strongest, the thing that someone accepts voluntarily and willingly, and someone with fear and doubt. The fourth key event of the season - the success of the Islamic State - partly rises above all of the others, because it shows an element, where diplomacy and politics are helpless, in whatever form they are manifested. The Islamic State is the system wreck of the model, the result of the 20th century arrangement of the Middle East. The writer is head of Russia's Council on Foreign and Defense Policy.